In the following interactive, you can vary parameters to produce the conics we learned about in this chapter. In the applet, you'll see two cones joined at their apexes. 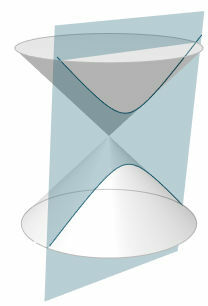 Imagine these cones are of infinite height (but shown with a particular height here for practical reasons) so we can see the extended conic sections. As you change sliders, observe the resulting conic type (either circle, ellipse, parabola, hyperbola or degenerate ellipse, parabola or hyperbola when the plane is at critical positions). Change the z-value, which moves the plane up or down. Move around the 3D graph by dragging it up, down, left or right.